The Documentation Center of Cambodia (DC-Cam) in Phnom Penh enables research into the years 1975 – 1979, when the Khmer Rouge killed almost two million Cambodians; its dual aims are to record the events of that time to ensure they are not forgotten, and to bring the perpetrators of great crimes to justice. The Center presently contains the world's largest archive on the Khmer Rouge, holding over 1 million pages of documents and 6,000 photographs. Research undertaken by DC-Cam’s staff and volunteers has resulted in the publication of many books, including history textbooks and teacher-training materials for local use. But what about English-language books for the international general reader? DC-Cam’s director, Youk Chhang, recommends Bou Meng: a survivor from Khmer Rouge Prison S-21, by Huy Vannak, which is published by DC-Cam itself, and The Last One: an orphaned child fights to survive the killing fields of Cambodia by Marin R. Yann, published by Outskirts Press, and available from their website, http://www.outskirtspress.com. 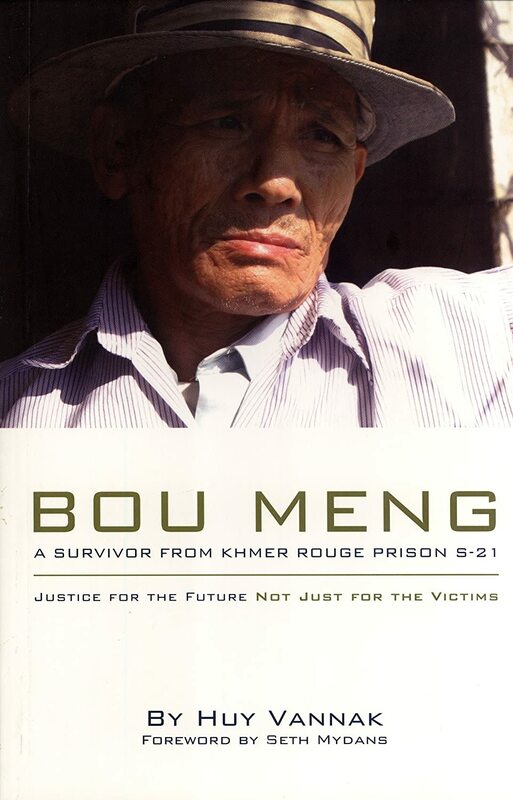 If you happen to be in Phnom Penh you can buy Bou Meng direct from Bou Meng himself, at the Tuol Sleng Genocide Museum, formerly the notorious Prison S-21 of the book’s subtitle. Bou Meng is a harrowing read. At least 16,000 people were imprisoned and tortured at S-21, of those sent there, only 14 people survived. Bou Meng was one of the 14; his life was spared because he was an artist, and the regime needed him to paint portraits of the Khmer Rouge leader, Pol Pot. Bou Meng, who in chapter 2 talks directly to the reader through Huy Vannak’s translation, is unsparing in his description of deprivation and torture, both mental and physical. This is typical: The interrogator kept asking me the same questions. I replied with the same answers. The interrogator grasped a bunch of torture materials, including bamboo sticks, whips, rattans, cart axles and twisted electrical wires. He asked me to choose one of them. I did not want any of them because they were tools to hurt me. But I did not have any choice.